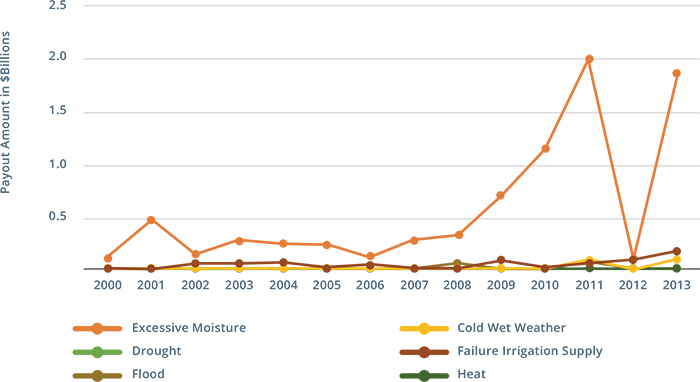 FIGURE 1: EXCESSIVE MOISTURE DWARFS ALL OTHER CAUSES OF PREVENTED PLANTING PAYOUTS. 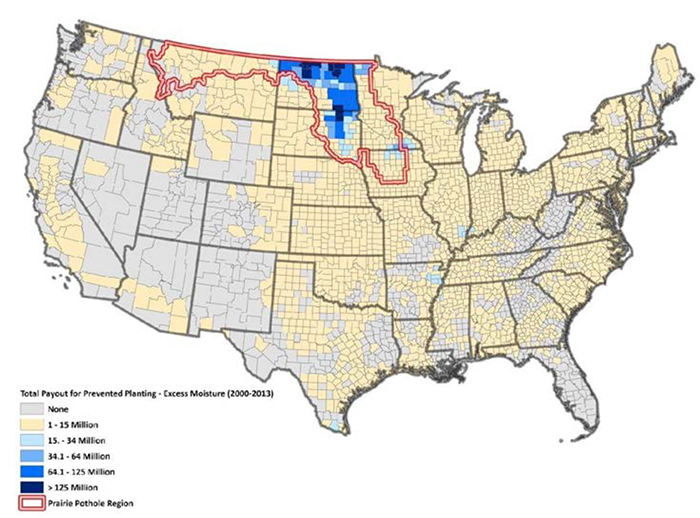 No less than 87 percent of all prevented planting payouts between 2000 and 2013 were for excessive moisture, and most went to a handful of counties in the Prairie Pothole Region (PPR), which is famous for its thousands of shallow wetlands interspersed amid cropland and grassland. Prevented planting payouts for excessive moisture are concentrated to a remarkable degree in a handful of counties in the Prairie Pothole Region. The payouts go out year after year to the same counties and the same handful of farm operations (Figure 2). Moreover, the payouts are huge, especially since the crop price boom that began in 2005. In many years, the moisture-related payouts greatly exceeded payments through so-called direct payment subsidies, which were the most important farm income support program from 1996 to 2014. From 2000 through 2013, the 195 counties in the Prairie Pothole Region accounted for fully 60 percent of all policies (473,833 of 787,510) that generated excessive moisture payouts. They totaled a whopping $4.9 billion, 61 percent of the $8 billion in excessive moisture claims paid over that period. This means that 9 percent of the 2,191 counties that generated excessive moisture payouts got 61 percent of total dollars paid and accounted for 60 percent of the policies that generated payouts. A still closer look reveals that the size and concentration of payouts for prevented planting due to excess moisture are even more astonishing. From 2000 to 2013, 65 counties – the dark blue area in Figure 3 – generated payouts for excessive moisture 14 years in a row. These counties – 30 in North Dakota, 30 in South Dakota and five in Minnesota – accounted for fully 79 percent of the policies that paid claims in the Prairie Pothole Region and fully 69 percent of the total amount paid. Even more strikingly, the counties that collected 69 percent of the payouts were home to only 27 percent of the farms in the region. Another 29 counties had excessive moisture claims paid in 13 of the 14 years, accounting for 21 percent of all payouts in the region. Together, these 94 counties account for an astounding 90 percent of all payouts due to excessive moisture in the region and 55 percent of all such payouts nationwide. Growers in those 94 counties also accounted for 94 percent of all policies generating moisture-linked prevented planting claims in the region (Figure 4). 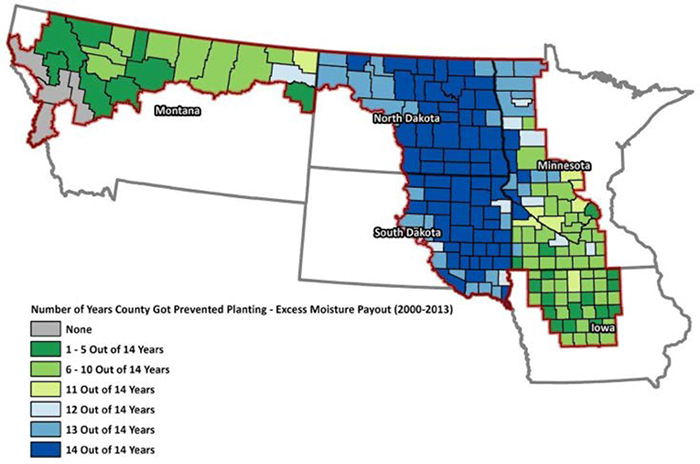 FIGURE 3: 65 COUNTIES (DARK BLUE AREA) IN THE PRAIRIE POTHOLE REGION COLLECTED PREVENTED PLANTING PAYOUTS FOR EXCESSIVE MOISTURE EVERY SINGLE YEAR FROM 2000 TO 2013. Click map below to see county by county details. The prevented planting provisions of the federal crop insurance program are a remarkably generous boon for a handful of counties in North and South Dakota. Total payouts due to moisture in the 65 counties that got payouts every year from 2003 to 2012 totaled $2.6 billion. That’s slightly more than the $2.5 billion that went to those counties as direct payments – the most generous farm subsidy program during that period. The payout total was only about a third of the amount of direct payments before the boom in crop prices, which drove up the claims amounts dramatically. From 2003 to 2006, prevented planting payouts totaled $373 million, while direct payments were $1.2 billion. Between 2007 and 2012, however, the payouts were nearly double the direct payments -- $2.2 billion compared to $1.3 billion. "In crop years 2006-08, for example, RMA records show crop insurance paid more than $400 million of claims on acreage with 'normal' weather patterns in the Dakotas and Minnesota. 'We have documented cases of policyholders not able to plant wetlands for up to 17 consecutive years and collecting an indemnity,' another agency official said in a background interview with DTN. In fact, approximately 1,300 growers had made prevented planting claims for at least 10 consecutive years, and another 2,200 for at least five years. In many counties, prevented planting payouts for excess moisture account for nearly all crop insurance claims year after year. For example, they were 70 percent of all crop insurance payouts in Bottineau County, 67 percent in Ransom County and 66 percent in Burke County, all in North Dakota. Two counties – Brown, South Dakota, and Ward, North Dakota – illustrate just how generous the payouts are. From 2000 to 2013, Brown County harvested more than $270 million in moisture-related prevented planting payouts, while Ward collected almost $200 million. The average county payout in the Prairie Pothole Region over the period was a comparatively tiny $26 million. Even before the spike in crop prices, payouts in Brown County totaled $47 million, 30 percent more than the direct payments to growers there. As crop prices began to climb between 2007 and 2013, payouts soared to seven times the $32 million in direct payments in Brown County and four times the $46 million in Ward. Average payouts rose from $34/ acre to $63/acre in Brown County, and from $20/acre to $42/acre in Ward.